Australia’s favorite online casino is playing matchmaker these days! No, we’re not talking about helping you look for your soulmate (although that might not be a bad idea in the long run). Instead, the site is running a super Matchmaker promotion where you’ll be treated to a serious match bonus. Roo Casino figures that most of us are pretty indecisive by nature. Whether we are trying to find the right tie to be paired with a shirt or the right bag to pair with your shoes, there is always something that needs matching. To help offset these daily challenges, Roo Casino has made it easy for you with an offer which, it says, is a match made in heaven. "Always stay true to your Roo!” calls the online casino as it explains what the 25% match bonus is all about. You can claim a 25% match bonus of up to $100 with one deposit of $25 or more every day. It really is as simple as that! It’s important to point out that the 25% match bonus at Roo Casino is a daily offer. This means that you can go back day after day to claim the rewards, which is a great advantage in itself. And if you miss out on the offer one day, it’s great knowing that you can head back the next day (and the next, and the next …) to claim it again. In order to claim the offer, head to the “My Promotions” section at Roo Casino. 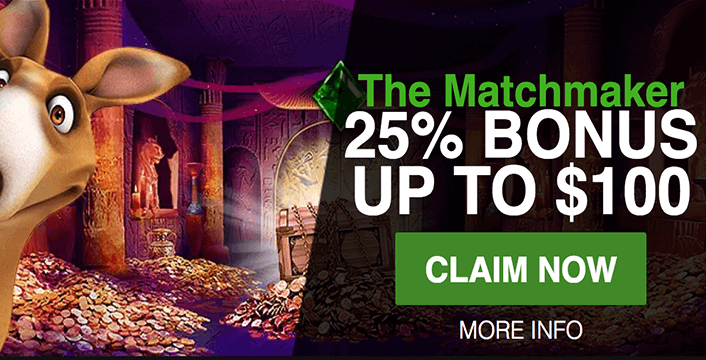 The 25% match bonus is an offer that is available to all ROO Casino players who have made one successful deposit into their real money casinos account before the start time of the promotion. Each day, the promotion kicks off at 00:00 GMT and runs for 24 hours until 23:59:59 GMT. You may not combine the 25% Daily Match Bonus with other promotions available at the online casino. To be able to claim the 25% bonus, you have to make a minimum deposit of $25. The maximum amount you can claim with the daily match bonus is $100. You may only claim the match bonus once per day. Wagering requirements apply to this offer. You need to wager the bonus + deposit amounts 20 x. You may not receive any kind of bonus in case of a pending withdrawal. If you’re already taking advantage of all these daily goodies at Roo Casino, don’t forget to check out what other cool things you can claim at this site. One of them is a daily free spins offer through the Keepin’ it Reels! promotion at this site. Roo Casino promises to “keep it real and keep it Roo” with this very straightforward but highly beneficial offer. You can claim 30 free spins on Alkemor’s Tower slot game every single day at the online casino. All you need to do is make a deposit of $25 or more every day. That’s 30 free opportunities to hit the jackpot, 30 free opportunities to enjoy a top notch online slot game and 30 free opportunities to have some fun, every single day! 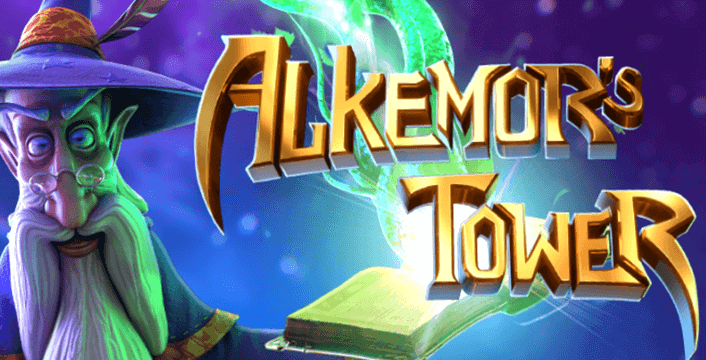 The free spins offer on Alkemor’s Tower slot is open to all Roo Casino players who have made one successful deposit into their account before the start time of the promo. The promotion runs daily from 00:00 to 23:59 GMT. You may not use this promotion in combination with other promos at the site. You need to make a minimum deposit of $25 in order to be eligible for the free pokie spins. You can claim the offer once a day by visiting the My Promotions section of the online casino. Wagering requirements of 20 x apply to the offer (free spins winnings + deposit). Betsoft Gaming’s Alkemor’s Tower slot was released in 2015 and has since gone on to become one of the software group’s most popular 3D pokie. The game takes you on a magical journey where spells, wizards and fantasy are de jour. The 243 ways to win game boasts multiple bonus features, including two wild symbols, a Spell Book scatter and the chance to win up to 30 free spins. The Elemental Spells feature rewards according to bonus levels, with rewards including extra wilds, cascading symbols, wilds and more.